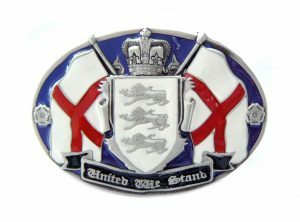 This quality pewter belt buckle features two St. George’s flags and a shield showing three lions. The banner reads ‘United We Stand’ in old English text. This striking belt buckle is hand-finished in red, white, blue and black enamel.